Oops! The idea of a museum and excursion trains out of the old CIBA site was a nice pipe dream. After an hour of research, I found out the site is owned by BASF and is still contaminated (federal Superfund site) with BASF stating cleanup will probably last decades longer. R&DB wrote: Oops! The idea of a museum and excursion trains out of the old CIBA site was a nice pipe dream. After an hour of research, I found out the site is owned by BASF and is still contaminated (federal Superfund site) with BASF stating cleanup will probably last decades longer. Wow!! Good research, Harry. They might need the line to transport the contaminated soil now. They might need the line to transport the contaminated soil now. They truck it out. There is not much solid waste, the real problem is ground water contamination. CIBA and now BASF have been doing remediation since 1990. It will probably continue into the foreseeable future. Google: BSAF Toms River APP for more information. 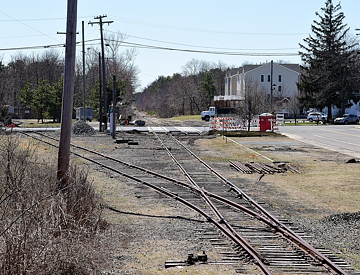 There is nothing happening at the old Ciba Geigy site (formerly Toms River Chemical) that would use rail service. It is basically a pump & treat groundwater remediation project. The area is mostly sandy. Once the drums containing the waste corroded, the chemicals leaked out and dropped straight into the water table. The job is all about containing the plume and pumping it up to the surface for treatment and disposing the clean water. I have seen videos of the rebuilt CNJ Blue Comet line and a portion looks close to being finished and reactivated. The Gateway project once underway will give this line a real boost. The NJT MOM project mentioned here is hard to understand. MOM = Middlesex/Ocean/Momouth. The old CNJ line runs through parts of Ocean and Atlantic Counties. From what I can see it doesn't offer much in the way of passenger rail for Ocean. What does this line really offer NJT???? Rebuilt in its entirety it could offer a connection to the Atlantic city line, but inOcean??? In Ocean County, the heaviest populations are in Brick, Toms River and Lakewood. If MOM was ever acted upon, it's initial terminus would be Lakewood (right next door to Brick). Further musings extended the line down to Lakehurst with others discussing reactivating the Toms River Industrial and setting up a passenger terminus at either the old Cieba Geigy property or even extending it towards the current Park & Ride in the Toms River downtown area by the Parkway. A push further south towards Forked River would be very difficult since the ROW was torn up when they rebuilt Rt 166 (formerly Rt 9) right there by the Park & Ride. Others discussed a desire to push the passenger line from Lakehurst south to Whiting (Jnctn) to serve the large senior development there. But all together constitute a lot of dreaming that would require huge funding. With the lack of of availability of slots on the NE Corridor, the best one could hope for would be a transfer station at Red Bank, Matawan, or North Brunswick. NJT picked Lakehurst as the terminus in their plan because there is no place for a yard in Lakewood. They decided the spur into the Naval Station could be their Yard. I agree the potential traffic at Whiting may be worth researching as CMSL / NJSL has repaired the line past that point. Toms River is probably a better choice for the terminus. Tons of potential traffic there as well. The whole idea of MOM is to get some cars and buses off the Route 9 corridor. You are absolutely right about changing train at the northern (RR eastern) end because diesels are frowned upon beyond there. CJPat wrote: In Ocean County, the heaviest populations are in Brick, Toms River and Lakewood. If MOM was ever acted upon, it's initial terminus would be Lakewood (right next door to Brick). Further musings extended the line down to Lakehurst with others discussing reactivating the Toms River Industrial and setting up a passenger terminus at either the old Cieba Geigy property or even extending it towards the current Park & Ride in the Toms River downtown area by the Parkway. A push further south towards Forked River would be very difficult since the ROW was torn up when they rebuilt Rt 166 (formerly Rt 9) right there by the Park & Ride. Others discussed a desire to push the passenger line from Lakehurst south to Whiting (Jnctn) to serve the large senior development there. We need to get back to "CMSL Cape May (NJ) Seashore Lines Non-Passenger Operations" topic--My fault for some of the "off topics" here--Sorry. Thank you. Any updates on how the Lakehurst crossing work is progressing? I suppose Wednesday's storm certainly did not help things. I just wanted to give a kind reminder that there is a very dormant Tom River Industrial Track forum that could use a little action. This information ties into many different threads, however it can be duplicated into other relevant areas. The choice is yours.